Psycho Solo Diver – Online Diving Blog and more!Boat Reviews | Psycho Solo Diver - Online Diving Blog and more! You are currently browsing the archives for the Boat Reviews category. 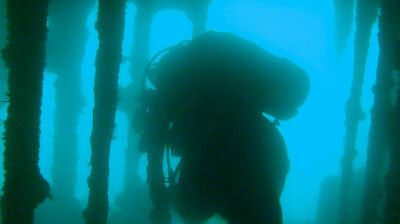 Back on the boat from my first dive, I took off my BCD and sat down. 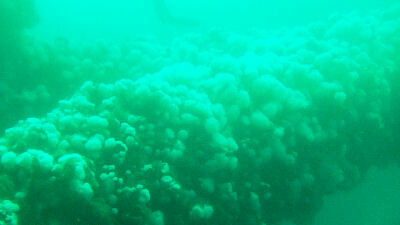 I started to get a little sick – like dizzy – and it felt like my dry suit was constricting. Then I figured out, yes, my dry suit is constricting because the release valve is open and I was getting dizzy because the boat was tossing up and down in the swells. I felt better after a while. Captain Jeff of the Pacific Swann provided chicken noodle soup and Mike C. provided smoked salmon to eat while we did our surface interval. 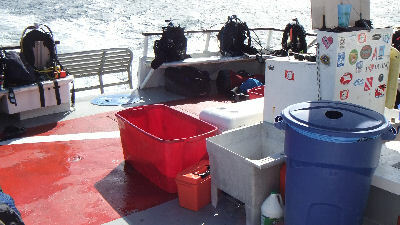 The boat motored over and moored onto the marker for the Ruby E.
After 45 minutes, divers were heading back into the water – Donna and I were the first two over. I felt cold water leaking into my dry suit. I gave my zipper a quick jerk to seal it and that stopped the leak. 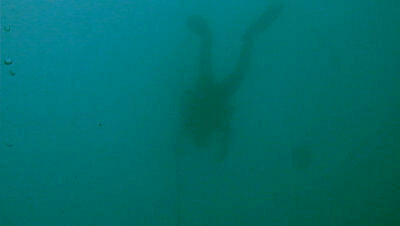 We swam to the bow line and descended. I haven’t dove the Ruby E. for probably seven or eight years – a lot has changed. 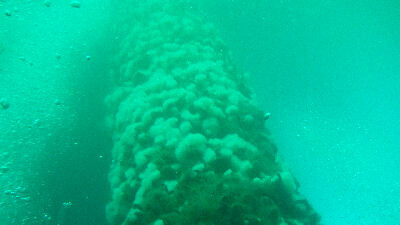 There are no solid walls above the deck and it looks like the hull has partially collapsed. 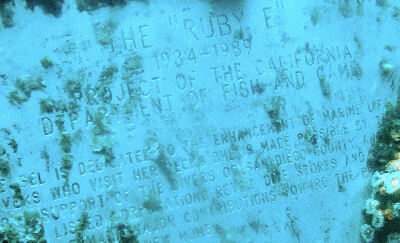 Fish under the stern of the Ruby E.
Apparently, the Ruby E was originally a smuggler’s boat until being turned into a Coast Guard vessel. Off Gassing over the Ruby E.
In a way, I like diving this wreck better than the Yukon because it’s much smaller and less intimidating. Me and my diving buddy, Donna The Hot Biker Chick. 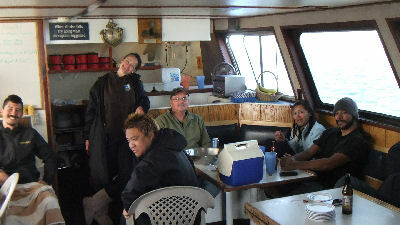 The Pacific Swann is a comfortable six-pack diving boat run by Captain Jeff. Soup, snacks, water, weights and completely filled tanks were available for the excursion – he did the best to make our trip as enjoyable as possible, and he succeeded. However, unless you enjoy diesel exhaust, don’t sit at the rear of the boat while the engines are on – a feature that heavy smokers should appreciate. 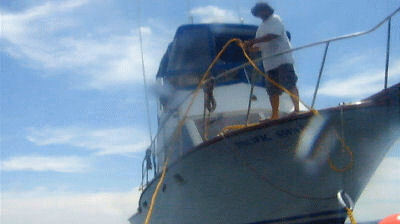 Apparently, Captain Jeff has a real job during the week and the Pacific Swann is his “weekend warrior” project. Bob and I went directly back home after the boat docked; his excellent driving ability to weave in and out of slow moving traffic got us back within two hours. We were eating a light snack of fruit, chips and dip during our surface interval when the question about the second dive was asked. Stay here, or to another oil rig? 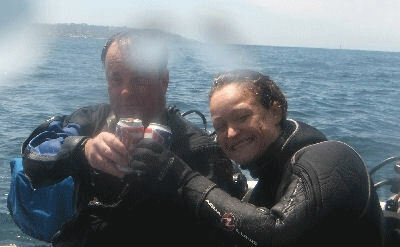 Donna apparently found a more suitable, less macho, dive buddy, so I paired up with Dan. This was my second dive with my new BCD… I grabbed what I thought was a purge value and ended up pulling my weight pouch out. Luckily it was empty, as I still use a weight belt. There’s a floor of beams around the 60 foot mark. 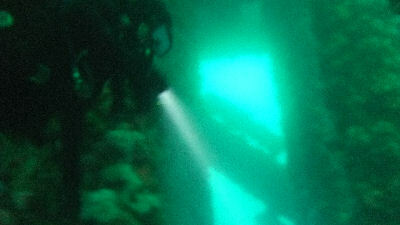 I spent most of my time at this depth, cruising around the horizontal beams, trying to take some good pictures as my camera was warning that the battery was very low. 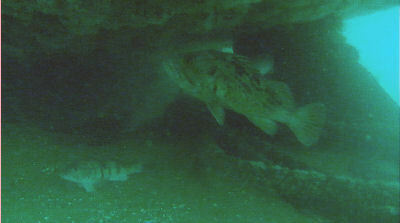 If I wasn’t so macho, swimming around underneath all those dark beams may have spooked me out. I slowly surfaced just as Dan did. We started the dive and ended the dive together, so that’s good enough in my book. Some divers brought back some big scallops. 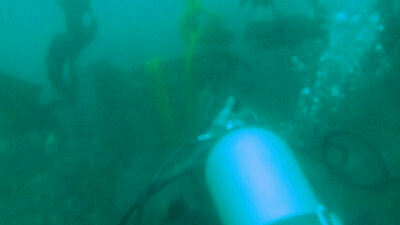 I was also fortunate enough to meet Carl, a friend of one of the hottest celebrity divers in the world – Paris Hilton. He apparently has even been to her house; meeting him was better than previously meeting someone who did catering for Paris. 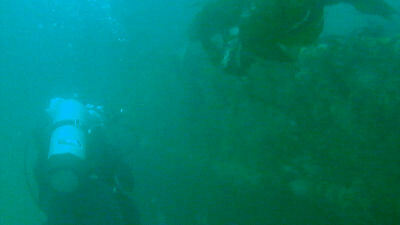 Maybe one day I will actually get to meet Paris Hilton, or better yet, even dive with her. 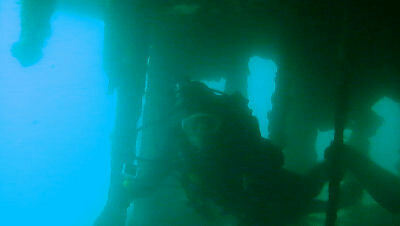 With ten divers, how much beer did you think the boat had? If your guess was one can of Tecate, you would be correct. Luckily, I brought a few Bud Lights and Donna had a few Tecate bottles, so debriefing was light, but that was probably a good idea on Super Bowl Sunday. *Posting of this has been delayed because of the Super Bowl.